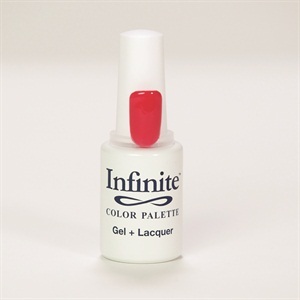 Get creative and mix up your own custom gel-polish shade with the Infinite Color Palette system from Americanails.com. A few simple steps will transform nearly any nail polish color into durable gel-polish that can last for weeks without peeling or chipping, according to the manufacturer. Mix colors, add glitters, and have fun concocting a new formula. 1. Attach filler tube to the Lacquer Extractor. 2. Gently withdraw nail polish to fill the Lacquer Extractor to the marked line. 3. Carefully insert the nail polish into the Infinite gel-polish bottle. 4. Shake the bottle for two minutes. 5. Buff the nail tip on the display ring and wipe it clean. Apply a thin layer of Infinite Color Palette Base + Top Coat to the tip and cure for 30 seconds under an LED light or two minutes under a UV light. 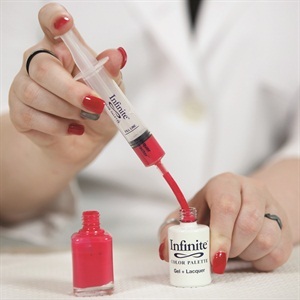 Apply a first coat of the mixed formula to the nail tip and cure for 30 seconds under an LED light or two minutes under a UV light. Repeat with the second coat and cure. Seal the color with a layer of Infinite Color Base + Top Coat and cure. Remove the tacky residual with pure alcohol or finishing wipe. 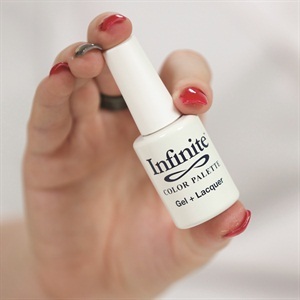 Attach the display ring to the Infinite Color Palette gel-polish to easily identify the new custom color. 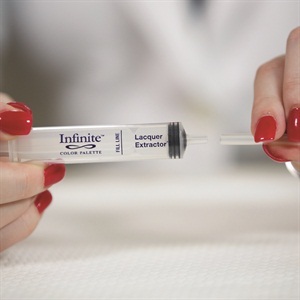 Troubleshooting tips: Avoid chunky glitter polishes that can clog the filler tube. Be careful not to extract ball bearings from the bottom of the polish bottle. Due to variations in pigmentation, certain finished gel-polish shades may be slightly more translucent than the original lacquer shades.